From the beautiful capital city of Vienna to the world-famous ski resorts of the Tyrol and the renowned hiking trails of Salzburg, Austria is a wonderful year-round holiday destination offering crisp Alpine air and stunning mountain scenery. Find your dream ski chalet in St Anton, Ischgl, S_lden, Kitzbuhel, Saalbach or Alpbach; rent a large self-catering apartment in Vienna or Salzburg to enjoy some city sightseeing; or rent a holiday home in the Tyrol for a spring or summer hiking break, enjoying the fresh air, lush meadows and wild flowers. All of our big holiday properties in Austria sleep 10+, making them ideal for big families, hiking groups, or a bunch of friends planning a group skiing trip. Beautifully romantic privately owned 12th Century medieval castle, steeped in history and atmosphere, available for private hire - an ideal venue for entertaining and relaxing. Sleeps up to 90. Imagine staying in a beautiful big ski chalet in St Anton, Sell, Zell am See, Obergurgl or Mayrhofen; hiring a spacious apartment in Salzburg; or staying in a city centre guesthouse in Vienna to discover the capital's rich history. At Group Accommodation, we work hard to fulfill these dreams, and as a specialist group holiday company we are dedicated to bringing you the best big group holiday accommodation in Austria. It's not easy choosing where to stay in Austria, with such a fabulous range of winter sports destinations, historical cities and beautiful Alpine landscapes, not to mention excellent group holiday accommodation. Across Austria's nine federal states there are many different landscapes including glaciers, grassy meadows, alpine valleys, wooded foothills, vineyards, rolling farmland, river gorges and plains. Vorarlberg, Tyrol, Salzburg, Styria, Upper Austria and Carinthia are dominated by the Alps, while Lower Austria, the Burgenland and the federal capital of Vienna have a similar geography to neighbouring Hungary and the Czech Republic. The Tyrol (Tirol) is probably Austria's best-known region thanks to the many famous ski resorts found there. If you rent a big chalet in Tyrol you can visit the state capital of Innsbruck and the nearby glaciers and ski resorts of Kaunertal or Stubaier; see the medieval fortress of Schlouim Loch; and explore the picturesque historic Alpine village of Pinswang and the surrounding hiking routes and castles of Bavarian King Ludwig (Neuschwanstein and Hoheschangau) in Fussen. You can rent a chalet in St Anton or a holiday rental in Alpbach for a skiing holiday in one of Austria's top Alpine ski resorts, or enjoy the apres-ski nightlife in Ischgl and Slden. Head to a holiday house in Salzburg to explore the home of Mozart and true alpine Austrian culture, as well as the region's gorgeous scenery -- or time your trip to coincide with the annual Salzburg festival. Explore Hohe Tauern National Park, go skiing in Zell am See, or enjoy hiking and lake watersports in the summer. Book group accommodation in Carinthia (Krenten) to enjoy ski resorts such as Gerlitzen, Nassfeld and Turrach, and the region's superb lakes such as Millstaettersee and Werthersee, as well as the glamorous summer holiday resort of Velden. Stay in holiday accommodation in Lower Austria (Niedersterreich) to explore wine country _ including the compact region of Retzer Land; the town of Perchtoldsdorf; and the scenic UNESCO-listed vineyard region of Wachau, which is mild enough to grow almond and apricot trees, and is a great place for a boat trip along the Danube River. Rent group accommodation or a large holiday house in Styria (Steiermark), famous for its white wine, and you will be at the heart of one of Austria's prettiest regions. Stop off at a vineyard ("Buschenschank") near the border with Slovenia; explore Hohe Tauern National Park; pamper yourself at Thermenland's hot springs; and discover many of the locations used in The Sound of Music in the beautiful holiday region of Salzkammergut, home to crystal clear lakes, lush hills and mountains, and romantic towns and cities such as Hallstatt and St Wolfgang. Alternatively, hire a holiday property in Upper Austria (Obersterreich) to go sightseeing in Linz; tour beautiful Salzkammergut; and enjoy annual events such as the Ars Electronica Festival and the open-air Klangwolke cultural spectacle. Or stay in a hostel or guesthouse in Vienna (Wien) to explore the UNESCO-listed historic city centre with its beautiful architecture; stop off at famous coffee houses; shop at outdoor markets or seasonal Christmas markets; and visit top attractions such as Hofburg Palace and St. Stephen's Cathedral. 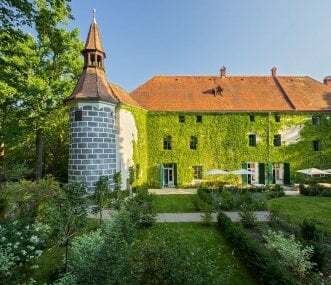 If you rent a holiday house in Burgenland you can enjoy the hot springs in the southern part of the region; visit some of the region's wineries; and see a variety of historic castles such as the 13th century Burg Bernstein, Burg Lockenhaus and Burg Schlaining, or the 12th century Burg Gessing. And for sparkling lake scenery and fabulous winter sports resorts, rent a holiday home in Vorarlberg, home to Lake Constance, diverse mountain landscapes, and a unique cultural heritage. We try to make it easier for you to decide where to stay by providing detailed property descriptions and images for every holiday home in Austria, alongside a list of activities available nearby. Our large group holiday homes in Austria are scattered across the country, so you can find large holiday properties in Tyrol, Salzburg, Burgenland, Carinthia, Lower Austria, Styria, Upper Austria and Vienna. Our selection of accommodation for large groups is unrivalled, and you can be confident that we have a large holiday villa in Austria that will suit your needs. Our impressive portfolio features large holiday chalets in Austria as well as other types of group accommodation such as guesthouses and hostels. Make your search for group accommodation easier by using our easy-to-use website bringing together the best big holiday villas in Austria for you to choose from. You can browse all of the properties in Austria using our Regional Search, or you can choose the country in our Main Search and then narrow down your results by several criteria such as location, property type, and how many the holiday villa sleeps.